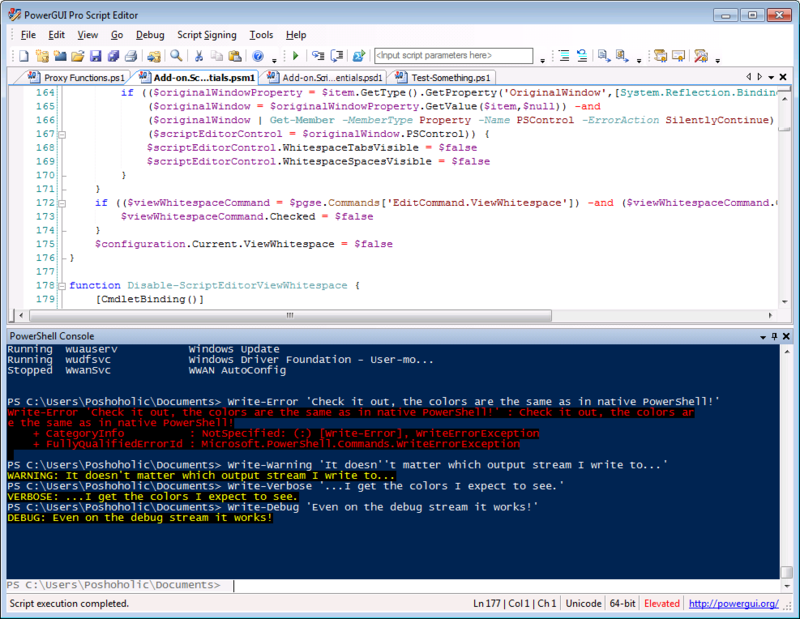 I really like the native PowerShell console look and feel. Something about the blue theme applied to the native console puts me in a comfort zone, and it just works for me. For a long time I have wanted to have the exact same color theme to be applied to the embedded PowerShell console in PowerGUI, and with the release of PowerGUI 2.4 I can finally create that theme. 1. Open the PowerGUI Script Editor and select Tools | Find Add-ons Online… in the menu. 2. In the dialog that appears, enter “Blue Console” into the text box and click on the Search button. 3. Once the Blue Console Add-on shows up in the results, click on the Add-on to select it and then click on the Install button to install the Add-on. This will download, unblock, install and load the Add-on in your Script Editor, and you’ll have a native blue theme applied in no time! If you’re not connected to the web, you can also install this manually by following the steps outlined on the Blue Console Add-on page on PowerGUI.org. Now that the PowerGUI Script Editor SDK supports any color in the embedded console, you can even create your own themes. The Add-on is just a PowerShell module and you can look at how it sets the colors internally to see how you could create your own theme. If you’re feeling ambitious, you could even build a theme-chooser Add-on something like the Script Colors Add-on by Denniver Reining and allow people to import/export color themes so that they can share them with one another. I think an Add-on like that would be fantastic for the Script Editor, and I can already think of a half dozen features I’d like to see in it. If you’re going to create an Add-on, be sure to install the Authoring Toolkit Add-on that I blogged about yesterday so that you’re working with all of the tools available to make it easier for you.